Ex-Principal Secretary, Government of M.P. 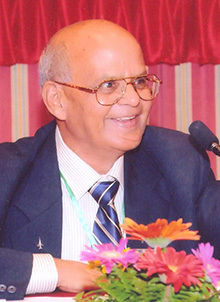 A pioneer in Renewable Energy Research and Education in India, Prof. H.P. Garg has achieved National and International recognition for his outstanding contributions to the development and design of solar energy technology applications. The first person in India to write his doctoral dissertation in the area of Solar Energy, his research has continually focused on fundamentals; design and technological upgradation; and commercialization of several solar energy devices. Largely due to the zeal and perseverance of Prof. H.P. Garg, a range of quality assurance processes have been adopted in India and abroad which has earned him the credit of Renewable Energy Man. In addition, Prof. Garg has spearheaded the establishment of academic programmes focusing on research and training in renewable energy at Indian Institute of Technology (IIT) Delhi, as well as at many other engineering institutions in the country. These programmes, today, provide the technical manpower for our renewable energy sector. He has also led the effort to develop suitable training material for several of these academic programmes, including his 14 books, more than 500 research papers and 50 technical reports. Prof. Garg has been actively engaged in Research, Development and Demonstration(RD&D), and Consultancy in the field of Renewable Energy; Technical, Management and Energy Education and Administration for the last 50 years. Prof. Garg has held several important positions such as Incharge of Solar Energy Section at Central Building Research Institute (CBRI), Roorkee (1965-1971); Head, Division of Wind Power and Solar Energy Utilization at Central Arid Zone Research Institute (CAZRI), Jodhpur (1972-1978) prior to shifting to Indian institute of Technology, New Delhi as Professor in 1979. During his principal assignment as a professor of Solar Energy at IIT Delhi since 1979 till to date he has also worked as Coordinator (Solar Energy), Institutional Coordinator (UNU Programme) and Head CES. In between, on deputation, he was Director General, M.P. Council of Science & Technology, Bhopal; Science Advisor to M.P. Govt. and Principal Secretary, Department of Science & Technology, M.P. Govt. during 2002-2004 and later Director, Institute of Technology & Management (ITM), Gurgaon for nearly one year. He has served as Senior Consultant at National Institute of Solar Energy, Gwalpahari, Gurgaon, Haryana for 4 years. Presently, Prof. H.P. Garg is the Director General at Trinity Group of Institutions, Dwarka, New Delhi - 110075.